NETWORK FINALS: The reruns of AMERICAN HOUSEWIFE and THE FLASH fell 0.1 in final numbers. CABLE HIGHLIGHTS: It was a strong night for OWN, where THE HAVES AND HAVE NOTS returned at 0.69, and the first part of the season premiere of QUEEN SUGAR was at 0.68. Last year, QUEEN SUGAR premiered after the season finale of HAVES AND HAVE NOTS, and they were respectively at 0.90/0.68. So QUEEN SUGAR not only held all of last year’s premiere number, but did it with a somewhat lower lead-in. 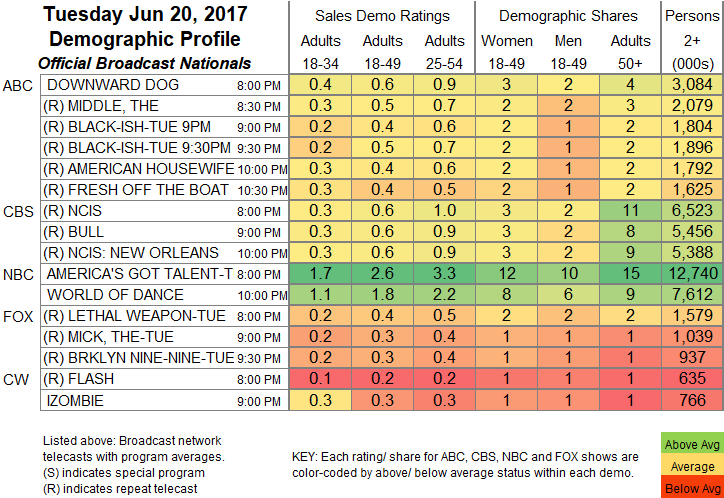 TBS’s WRECKED returned at 0.49/0.36, compared to last year’s 0.61/0.45 premiere. On Freeform, after PRETTY LITTLE LIARS slipped 0.03 to 0.43, the network ran a preview of the pilot for THE BOLD TYPE (which will officially premiere in July) at a faint 0.12. The 2-hour season finale of NatGeo’s GENIUS dropped 0.04 from last week’s hour to 0.12. USA topped Tuesday cable, with WWE SMACKDOWN up an impressive 0.22 from last week to 0.85, and TEAM NINJA WARRIOR up 0.08 to 0.38. Bravo’s BELOW DECK was steady at 0.50. On Discovery, DEADLIEST CATCH ticked up to 0.50, and DEVIL’S CANYON jumped a tenth to 0.30. On TLC, LITTLE PEOPLE, BIG WORLD gained 0.05 to 0.46, and 7 LITTLE JOHNSTONS was up 0.07 to 0.36. Spike’s INK MASTER climbed 0.05 to 0.44, and the REDEMPTION after-show was up 0.05 to 0.24. HGTV’s GOOD BONES rose 0.07 to 0.38. On Comedy Central, TOSH.0 grew by 0.07 to 0.35, and THE JIM JEFFERIES SHOW was up 0.05 to 0.24. TNT’s ANIMAL KINGDOM was steady at 0.34. 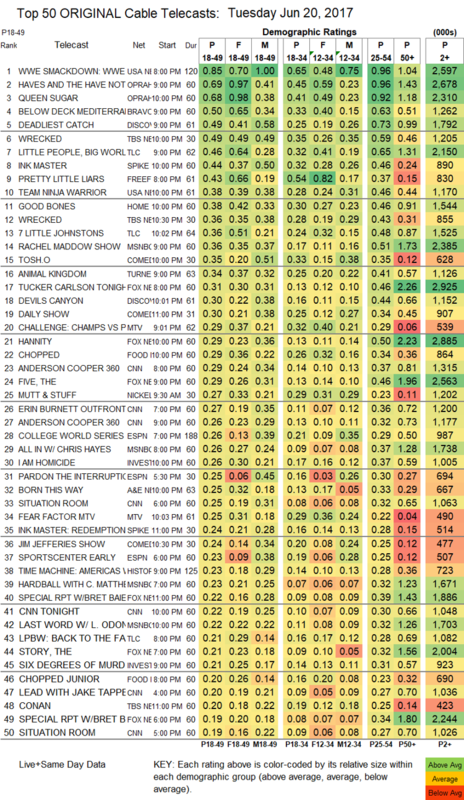 On MTV, THE CHALLENGE dropped 0.06 to 0.29, and FEAR FACTOR was down 0.13 to 0.25. On Food Network, CHOPPED remained at 0.29, and CHOPPED JR ticked up to 0.20. A&E’s BORN THIS WAY gained 0.03 to 0.25. On ID, I AM HOMICIDE stayed at 0.26, and 6 DEGREES OF MURDER was down 0.03 to 0.21. Syfy’s FACE OFF dropped 0.04 to 0.17.